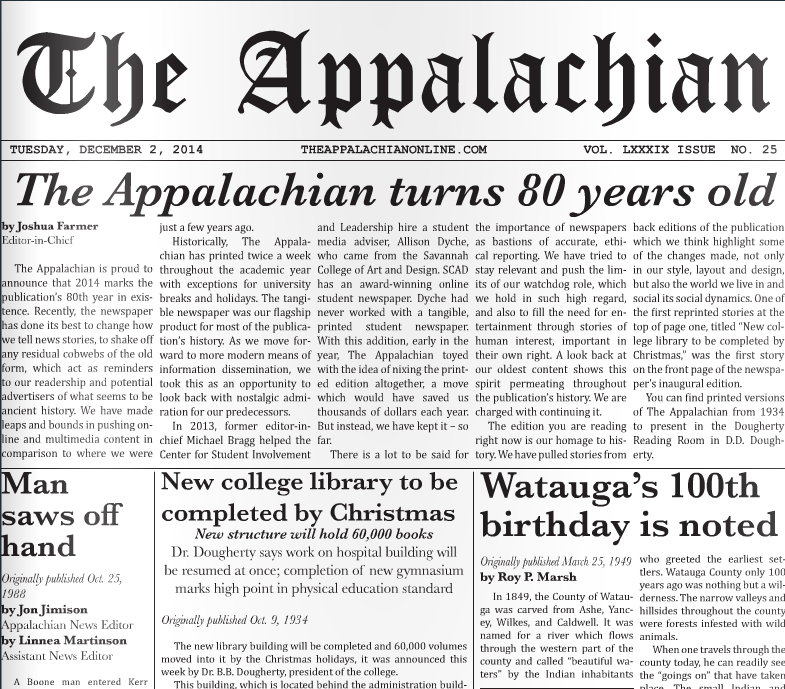 The Appalachian is proud to announce that 2014 marks the publication’s 80th year in existence. Recently, the newspaper has done its best to change how we tell news stories, to shake off any residual cobwebs of the old form, which act as reminders to our readership and potential advertisers of what seems to be ancient history. We have made leaps and bounds in pushing online and multimedia content in comparison to where we were just a few years ago. Historically, The Appalachian has printed twice a week throughout the academic year with exceptions for university breaks and holidays. The tangible newspaper was our flagship product for most of the publication’s history. As we move forward to more modern means of information dissemination, we took this as an opportunity to look back with nostalgic admiration for our predecessors. In 2013, former editor-in-chief Michael Bragg helped the Center for Student Involvement and Leadership hire a student media adviser, Allison Dyche, who came from the Savannah College of Art and Design. SCAD has an award-winning online student newspaper. Dyche had never worked with a tangible, printed student newspaper. With this addition, early in the year, The Appalachian toyed with the idea of nixing the printed edition altogether, a move which would have saved us thousands of dollars each year. But instead, we have kept it – so far. There is a lot to be said for the importance of newspapers as bastions of accurate, ethical reporting. We have tried to stay relevant and push the limits of our watchdog role, which we hold in such high regard, and also to fill the need for entertainment through stories of human interest, important in their own right. A look back at our oldest content shows this spirit permeating throughout the publication’s history. We are charged with continuing it. The edition you are reading right now is our homage to history. We have pulled stories from back editions of the publication which we think highlight some of the changes made, not only in our style, layout and design, but also the world we live in and social its social dynamics. One of the first reprinted stories at the top of page one, titled “New college library to be completed by Christmas,” was the first story on the front page of the newspaper’s inaugural edition. You can find printed versions of The Appalachian from 1934 to present in the Dougherty Reading Room in D.D. Dougherty. Find the printed edition here. 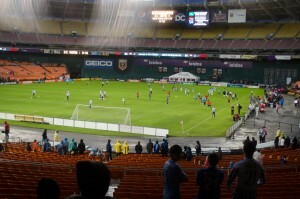 The magic of soccer growing in the U.S.